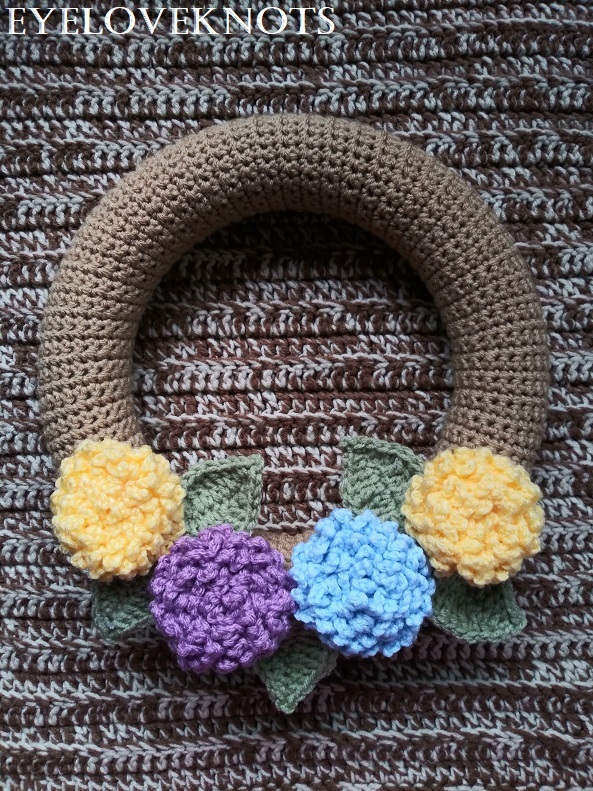 This post contains links to my free crochet patterns including a crochet wreath base pattern, crochet flower pattern, and crochet leaf pattern. It’s time again for the Inspire My Creativity Challenge! 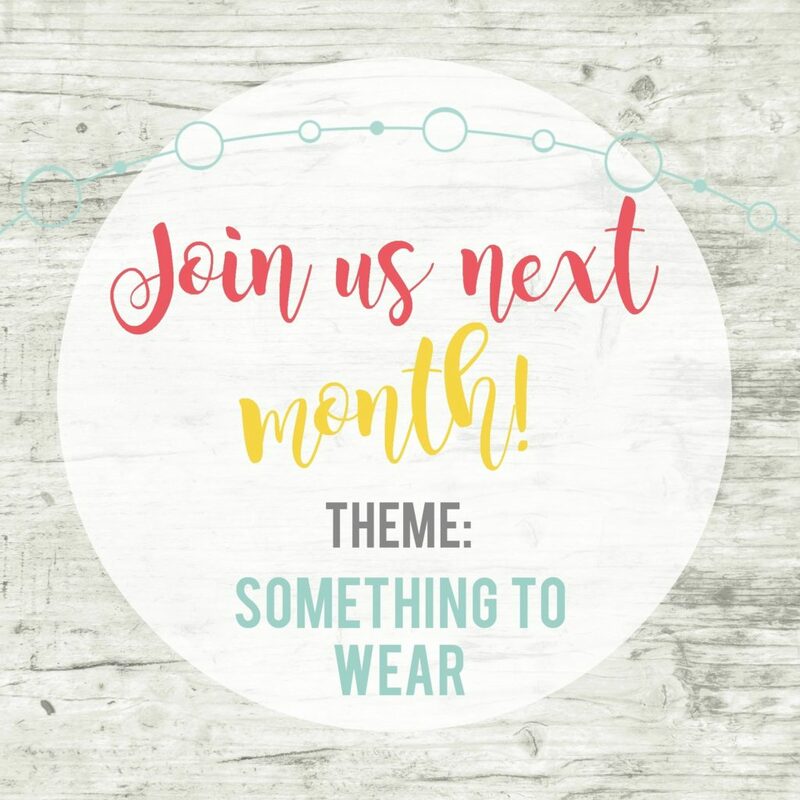 This is a monthly craft blog hop, and each month, there is a different theme. This month’s theme is Pastels, the colors, not the medium. If you have a post that fits that theme, feel free to link up too! First off, I want to apologize for the quality of my photos. I upgraded my phone, and the camera on it is disappointing, and I didn’t have enough time for any kind of back up plan, so I hope to retake some photos after I figure out how to work my actual camera, but for now, sorry! On to my wreath’s story! I love the Hydrangea flower, as you might be able to tell – being that I recently designed a Endless Summer Hydrangea Tote Bag, and shared the Frilly Flower inspired by the Hydrangea flower. I have several more ideas I’d like to share too! 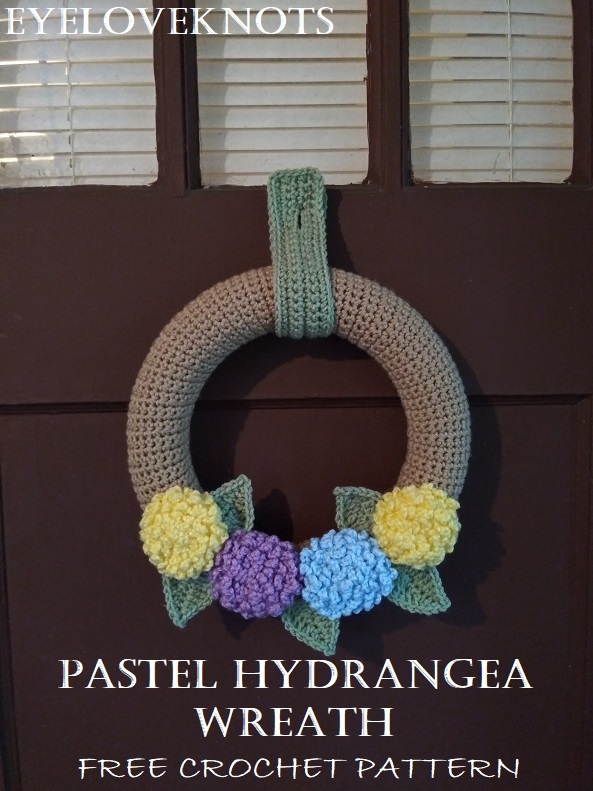 So this wreath is a pastel version of my take on the popular Hydrangea wreaths you may have seen on Etsy and Pinterest. I am pretty proud to say that all but the blue yarn came from my stash, so this project only cost me $3ish to make. Score! I will say this is a project post, but the actual patterns have been previously published on my blog, so I will be linking to them (so Google doesn’t penalize me for duplicate information). This wreath came together in around four hours. The wreath base cover will take the longest at just over two hours. 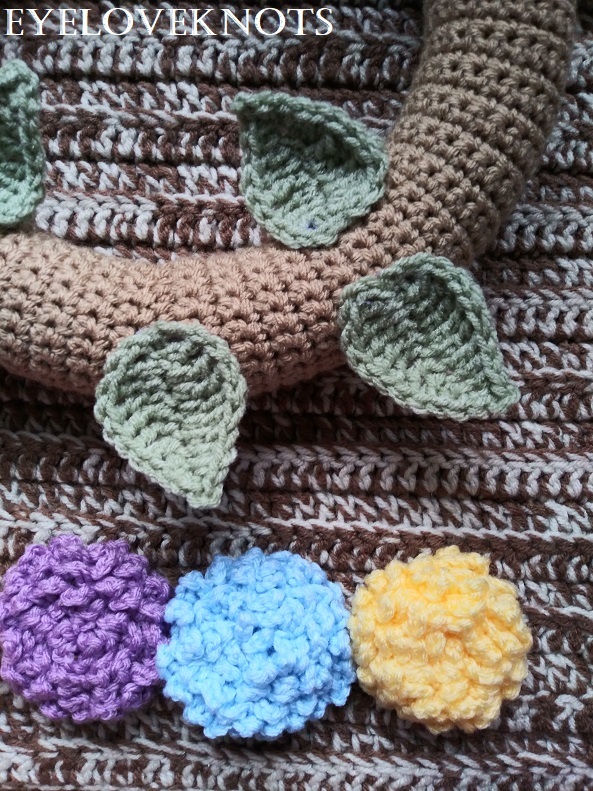 Each flowers takes about 20 minutes to stitch and sew up, and the leaves are 5 minutes each. 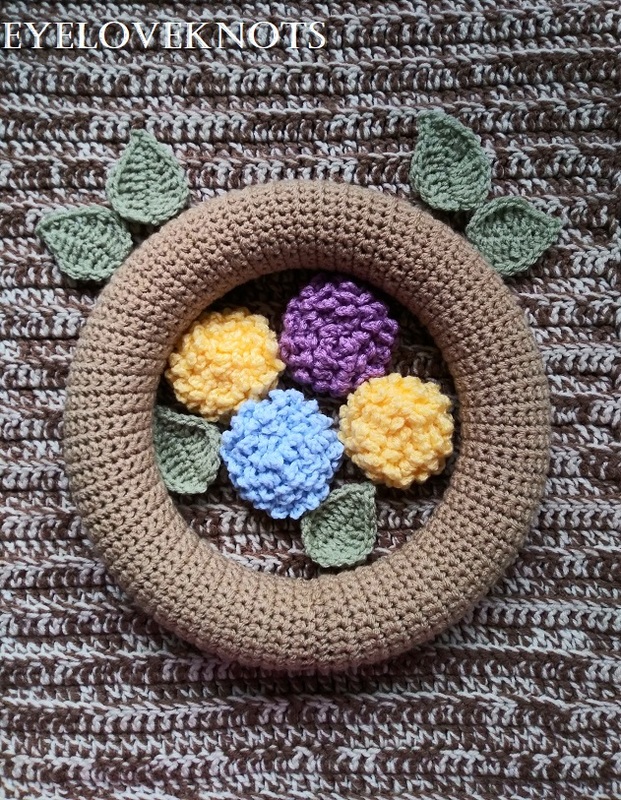 Firstly, you will need to gather your wreath base color (I used the Warm Brown), and styrofoam wreath form, and head over to my Basic 12″ Wreath Form Cover Free Crochet Pattern, found here on the EyeLoveKnots blog. Once finished, time to start your flowers and leaves! 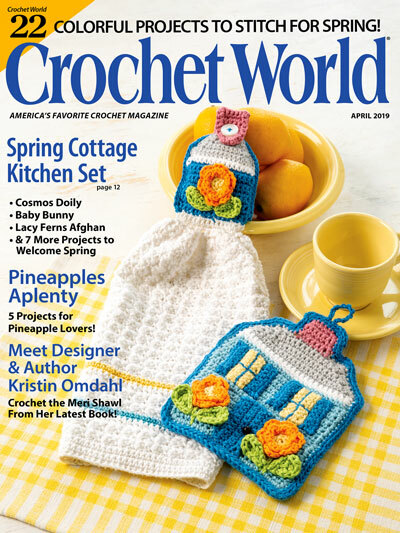 I used my Frilly Flowers Free Crochet Pattern to work up four flowers – two in Lemon, one in Light Blue and one in Orchid, then I completed five leaves using the Light Sage and my Basic Leaf Pattern 2 Ways withOUT the vein. I also used the Light Sage to make a Wreath Hanger – this is optional depending on how you will hang your wreath. Your wreath base should already be sewn closed on the styrofoam base. Decide where to place your flowers and leaves. Before hot gluing in place, just lay them down on top of the wreath base, and move around until you have found the perfect spots for them. 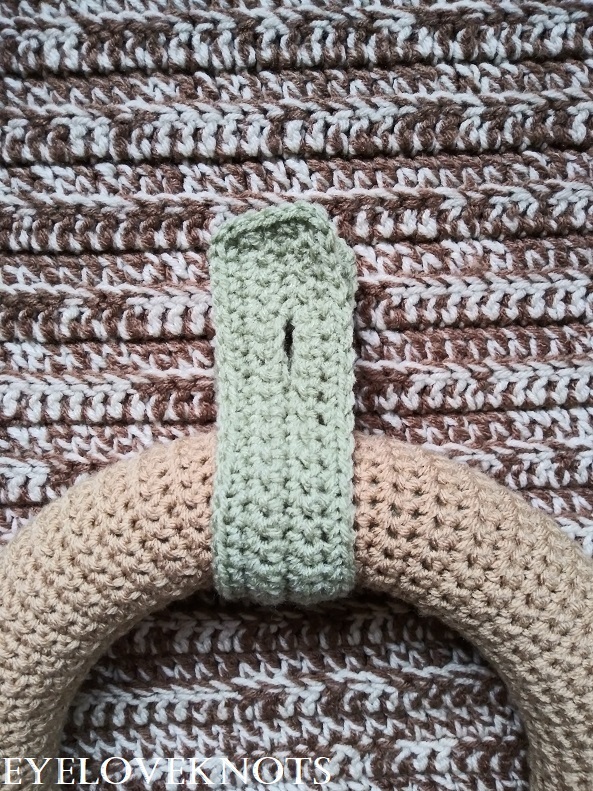 I suggest using them to cover up the seam from sewing the two ends together of the wreath form cover (or you can use your wreath hanger to cover the seam up). I find it easiest to glue my leaves down in place first. After settling on my design, I carefully remove one flower, tack the leaves in place with my hot glue, and work across, then I go back, and secure my leaves on better. If you want more security while you work, you can use some sewing pins to keep your leaves in place. Add in the flowers, and you have a beautiful Pastel Hydrangea Wreath! Perfect for Spring and Easter porch decorating. Please feel free to make and sell your own Hydrangea Wreaths using this pattern, but please DO NOT claim this pattern as your own nor should you sell my pattern, and DO NOT re-publish my photos as your own. DO NOT copy and paste my pattern anywhere, link to it instead. 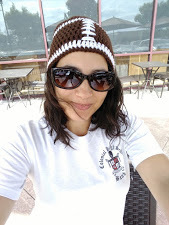 This post is part of the monthly link party I host called Inspire My Creativity. Each month, a group of bloggers all create a project based around a theme and this month the theme is PASTELS (the color/s). 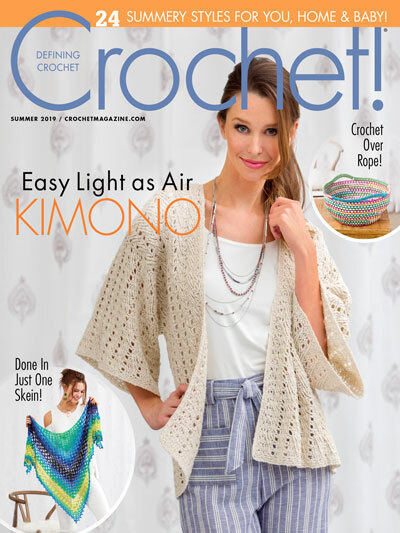 There are tons of great ideas and I know you’ll get inspired to create something fun and new! Oh, this is SO cute! 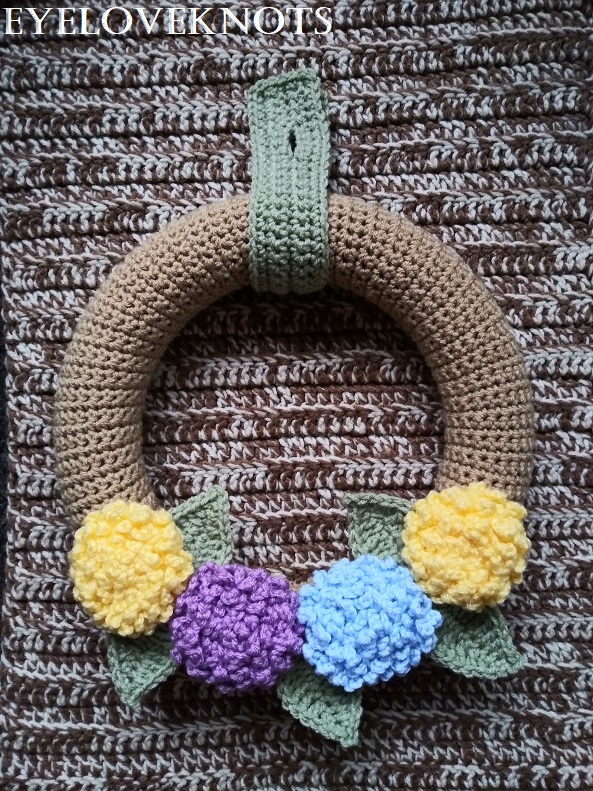 Seriously, I have a thing about wreaths and this is my favorite crocheted thing you’ve ever done! So original!!! Thank you!! I have a thing for wreaths too. 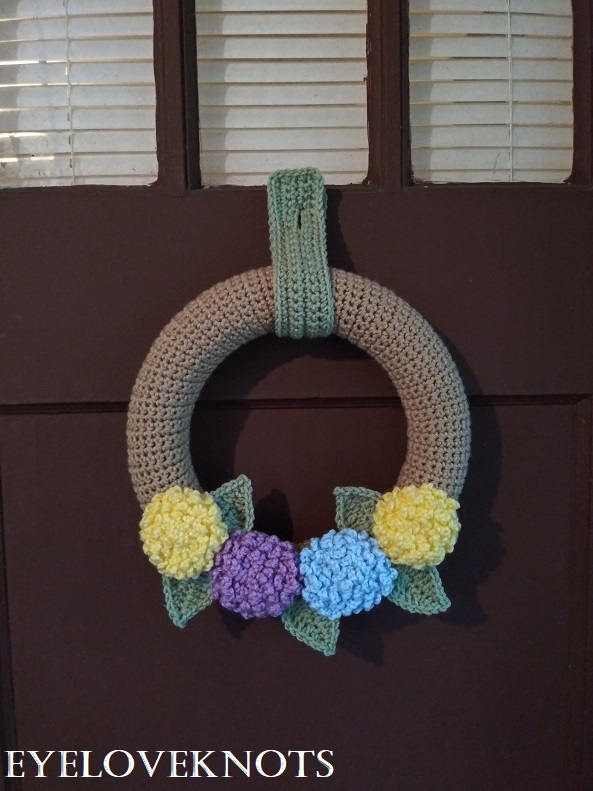 My door is always covered in a crocheted one of some sort. I am hoping to work on several more, and specialize more on this for my shop. $3ish projects are my favorite. These hydrangeas are adorable! What a darling wreath! I love the way you made those flowers – they’re the perfect touch for this project. So cute!